The uproarious, bestselling true story of the world's most sought-after con man, immortalized by Leonardo DiCaprio in DreamWorks' feature film of the same name. Frank W. Abagnale, alias Frank Williams, Robert Conrad, Frank Adams, and Robert Monjo, was one of the most daring con men, forgers, imposters, and escape artists in history. In his brief but notorious criminal career, Abagnale donned a pilot's uniform and copiloted a Pan Am jet, masqueraded as the supervising resident of a hospital, practiced law without a license, passed himself off as a college sociology professor, and cashed over $2.5 million in forged checks, all before he was twenty-one. Known by the police of twenty-six foreign countries and all fifty states as "The Skywayman," Abagnale lived a sumptuous life on the lam--until the law caught up with him. 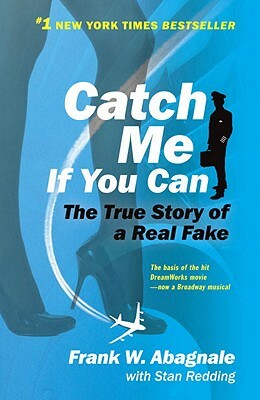 Now recognized as the nation's leading authority on financial foul play, Abagnale is a charming rogue whose hilarious, stranger-than-fiction international escapades, and ingenious escapes-including one from an airplane-make Catch Me If You Can an irresistible tale of deceit. A former professional impostor, Frank W. Abagnale is one of the world’s most respected authorities on the subjects of forgery and secure documents. A world-renowned consultant for more than twenty-five years, he lectures at the FBI’s Financial Crimes Unit and is a secure-document expert for the Standard Register Company and other high-security printers around the world. "A book that captivates from first page to last." "Whatever the reader may think of his crimes, the reader will wind up chortling with and cheering along the criminal." "Zingingly told... richly detailed and winning as the devil."